ALBUQUERQUE N.M. — The trail to the top was steep and lined with hundreds of black volcanic rocks. There was a slight breeze but it offered little relief to the already hot summer morning. 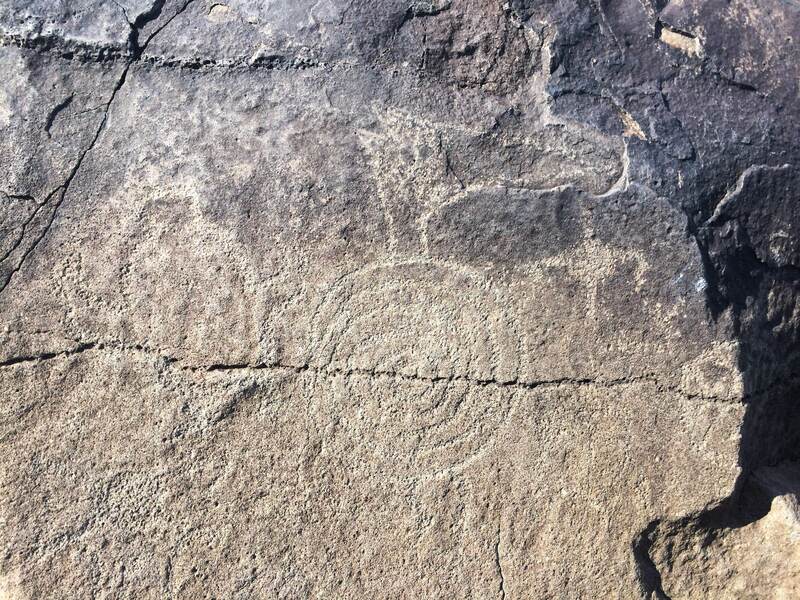 Laurie Weahkee looked to the summit of Boca Negra Canyon in the Petroglyph National Monument just outside Albuquerque, then began the one-mile hike to the top. A sacred carving on a volcanic rock at the Petroglyph National Monument. She pointed out ancient carvings along the path as she made her way. Weahkee spent more than a decade advocating for the preservation of the Native American petroglyphs, spiritual and cultural drawings inscribed on the volcanic rocks. To this day many ancient petroglyphs have been dislodged or destroyed. “A lot of the tribes identified their altars here and they utilize this place,” said Weahkee as she surveyed the remaining petroglyphs. At the top of the canyon, she looked around, only to see new neighborhoods and roads creeping toward the sacred space. Development she described as “painful” to witness. Weahkee’s work with the petroglyphs began in the 90s, prompted as housing and road development threatened the monument, and vandals were destroying and even stealing these sacred carvings. Video: Laurie Weahkee, executive director for the Native American Voters Alliance, remembers her fight for the preservation of the petroglyphs at the Boca Negra Canyon and other parts of the Petroglyph National Monument in Albuquerque, New Mexico. Weahkee’s work doesn’t come as a surprise to her friends or family. Over the last 40 years, she has become involved in a number of local, national and international causes and has become one of New Mexico’s most influential, indigenous activists. Her journey began in 1972. 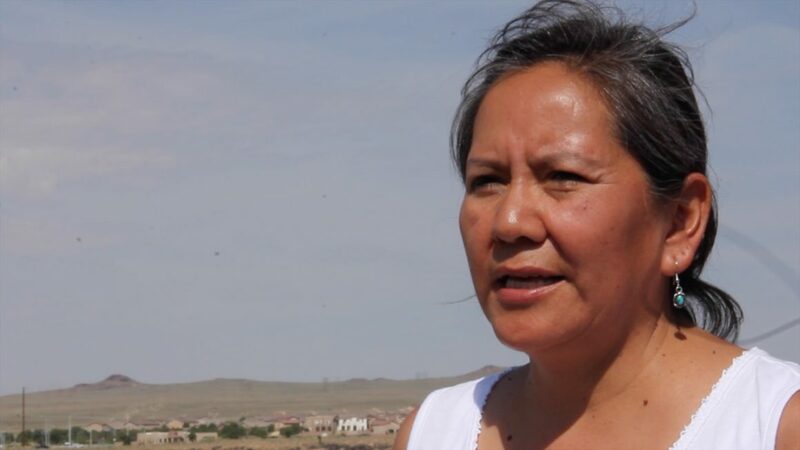 As a six-year-old, she participated in a march in Gallup, New Mexico to stop the city’s exploitation of Native Americans. “I had my little beaded ties on my hair and my long pigtails” said Weahkee. “My grandpa took me and I sat on his shoulders and we marched for about 3/4 of the march and I remember my dad saying ‘you better step out now,’ because they were afraid it was going to get violent at the end.” The march ended peacefully. Another aspect to organizing, she said, was learning how to control her frustrations when dealing with heavy issues. During the late 80s, she became an organizer with the Tonantzin Land Institute where they focused on land, water and human rights issues. As an organizer Weahkee helped Native American and Chicano communities advocate around land and water rights. In Chicano communities, a big issue was rights over acequias – communal irrigation canals that feed farm lands. During these battles over land and water rights she learned about the advantages of advocating for your own rights as opposed to relying on others. In 1990, she found herself participating in international work with community organizers across North and South America. They were organizing around the 500-year celebration of Christopher Columbus and his “discovery” of the Americas. During this time she realized how local issues can connect globally. Now, Laurie Weahkee is the co-founder and executive director for Native American Voters Alliance located in Albuquerque, N.M. This non-profit works with Native American communities to participate in civic engagement by increasing voter registration, encouraging people to vote and talking with elected officials. Laurie Weahkee laughs as she remembers good times while organizing with the SAGE Council. The SAGE Council led the fight to protect the petroglyphs from the suburban sprawl. Weahkee continues to advocate for sacred site preservation as well as environmental justice, economic justice and civic engagement through NAVA. She uses her past organizing work to guide her current organization and continues to be one of Albuquerque’s most influential community organizers. “We have to think about the generations yet to come” said Weahkee.